OTTAWA — Seven days can feel like an eternity in football. For the Ottawa REDBLACKS, the time between their 27-3 loss at the hands of the Calgary Stampeders last week and their upcoming date with the BC Lions this Friday (7:30 p.m. ET) will certainly have felt that way. Ottawa’s offence failed to lift off against Calgary, while its defence was carved up enough in less than one half by Bo Levi Mitchell and co that the second one was rendered moot. It’s a different story entering Friday’s contest for the BC Lions; bolstered by the return of veteran quarterback Travis Lulay, Wally Buono’s bunch stormed back to beat Winnipeg on a last-second field goal in Week 5 and will hope to build on that momentum this week. The two squads will meet in a special #LiveMic edition of Friday Night Football this week in the nation’s capital. Last week was a breath of fresh air for BC. Not just under centre, where Travis Lulay threw for 326 yards and a touchdown, but in terms of the end result as well. In a season in which the Lions had struggled for positive outcomes — on individual plays, series and games at-large — they turned a 17-point deficit into a legitimate win on home turf. Stopping the run will be markedly harder for BC this week without the presence of defensive captain and star linebacker Solomon Elimimian; the four-time CFL all-star was placed on the six-game injured list with a wrist issue, and will be unavailable for the foreseeable future. The task of securing a road win in Ottawa will be made more difficult on offence, too, by the absence of Jeremiah Johnson; Brandon Rutley draws in and will likely split touches out of the backfield with Chris Rainey. Rutley featured extensively for Montreal in 2015 and 2016, rushing for 949 yards over two seasons with the Alouettes. Second-year pro Jordan Herdman will slot into Elimimian’s spot in the heart of the defence; the Simon Fraser product’s tutoring under Elimimian actually dates back to 2014, when the latter was helping coach linebackers at SFU. In Ottawa, all systems were very much not a go against Calgary last week. The REDBLACKS managed a grand total of one first down in the entire first half against the Stamps, and Trevor Harris’s offence was booed off the field by the irked Ottawa peanut gallery. Thus, the message throughout practice for the REDBLACKS this week was one of redemption: Back to basics, high-percentage plays and execution. Campbell was his usual non-committal self when asked about any added importance to Friday’s contest. The matchup against BC will definitely have some added juice for REDBLACKS defensive back Loucheiz Purifoy; the outspoken 25 year-old spent the last two seasons with the Lions, and did not mince words on facing his former team for the first time. The REDBLACKS will be hoping D-lineman Michael Wakefield can continue his red-hot form to begin 2018; the FIU product has exploded onto the scene this season, with three sacks in his first three games after an inauspicious six-game, four-tackle start to his career in 2017. Like most of Ottawa’s key players, however, Wakefield was held at bay last week by Calgary: quarterback pressure will be key against Travis Lulay and a BC offensive line which has given up the second-most sacks (12) in the CFL. 0 — Times that BC QB Travis Lulay has thrown for 300-plus yards against Ottawa; the Lions pivot eclipsed the mark for the 20th time in his career against Winnipeg, and the REDBLACKS are the only CFL team he has not thrown for 300 yards against. 93 – Total passing yards for Trevor Harris last week against Calgary, the first time in his career he has been held under 100 yards in a game without being lifted due to injury. 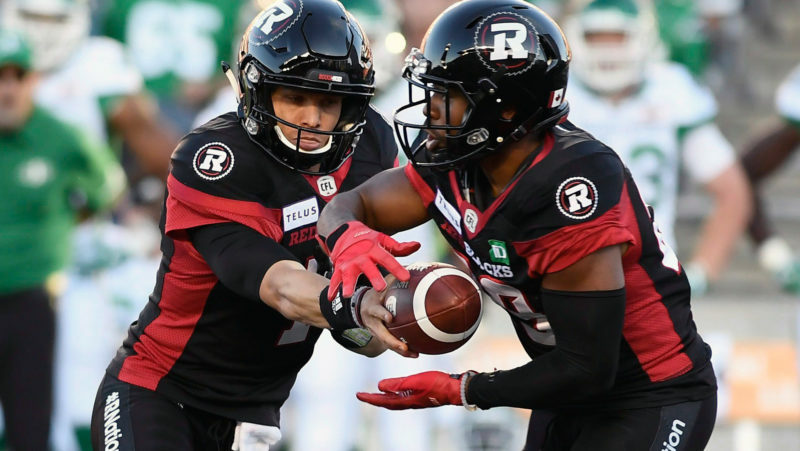 229 – As Harris goes, so too do the REDBLACKS; the Ottawa pivot is averaging 343 pass yards in the team’s two wins, and just 114 per-game in the team’s two losses. 297 – Receptions for Emmanuel Arceneaux since the beginning of the 2015 season, ranking him second in the CFL in that time frame to only Ottawa’s Greg Ellingson at 347. Believe it or not, Ottawa has won two in a row and four of its last six meetings against BC. The difference this time around is the Lions have momentum with Lulay under centre — Jennings started and took the loss in both meetings last season — while Ottawa does not. The REDBLACKS have some work to do to help erase the memory of last week’s dismantling at the hands of the Stamps; BC, meanwhile, will be hoping to tap into the same mojo that helped lead the Lions to a memorable fourth-quarter comeback last week.